This was a great story that I did not know that I would like so much. 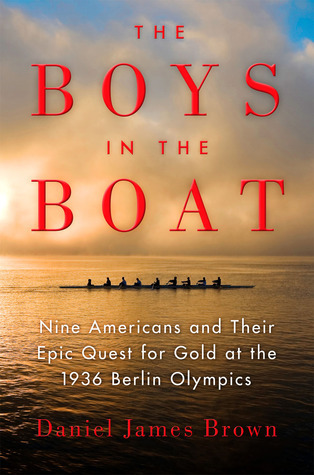 It begins with the author tracking down Joe Rantz, who I believe is the last living member of the 1936 Gold Medal winning 8 person rowing team from the University of Washington. Back then they had a series of competitions, races and who won was sent to represent the U.S. when he first meets Joe, he tells him that it was all about the book. That is where the book starts, about the builder of the boat. A man named George Pocock, who was from England. He and his brother leave England and come over hoping for a better life. It does not start out that way working for east coast boat builders seeing men getting their fingers cut off and knowing that he has no other trade he heads for the northwest and lands in the State of Washington and becomes the boat builder for the university and after a while most colleges are ordering boats oars and most anything else from him. Everything he does is made by hand. The story then goes into the life of Joe, who lost his mother and when his father remarried he was around 8 or 9. His father was a mechanic, so at times they would live in the city or at a mining camp. Wherever the job was. Not that his new mother liked this she was a city girl and a very good musician who before she passed away played with the symphony. Before all of that when he was a teenager his father step mother and brother and sister left one day. He was now by himself the first couple of nights was the toughest but he still went to school, and he did not tell anyone what had happened. He became a survivor doing jobs around town anything he could to make a little money. After a while his older brother found out what had happened and brought him to his home with him and his wife to finish high school. He had been going to school and getting good grades but his brother felt that this would help him get into college. It did but as soon as he graduated he went back to the woods to make money for school. When he got to Washington he found out that there were try outs for the crew, knowing that if he could make the team he would at least be given a little help on food. The hardest part for him was the rowing he had never rowed before but most of the other guys had not also. He makes the team and that freshmen team wins all of their races, but there is still turmoil going on with Joe. This book is filled with so much it is difficult to give it a proper review that it deserves. It is more than winning races it is over coming one’s self and believing in all of the other guys with you in the boat that you can overcome together. They did the story of each race was exciting the way the entire book was written had me captivated and I am grateful for the opportunity in reading such a wonderful book. I got this book from net galley.